I took International Politics to fulfill the interdisciplinary distribution area. I can understand why the course is interdisciplinary, because it’s certainly not just about politics. We talked alot about History, Economics, Law, and even Psychology. For this course I created this informative webpage on international law as it pertains to warfare. 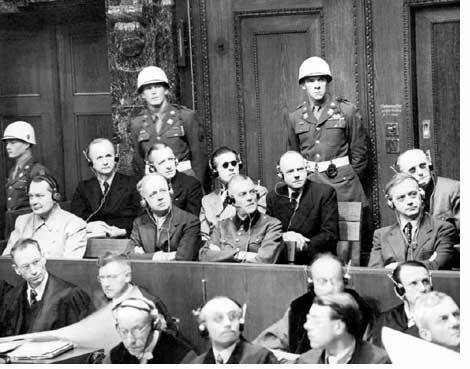 Uncredited photo of Nazi defendants at Nuremberg war trials on November 11, 1945. Taken from the Harvard Law School Bulletin of Spring, 2004. Fair Educational Use. Note to students: Each of these headings on your webpage will be links to subpages that you will create that will comprise your informative webpage. This is my reflection. This is my reflection. This is my reflection. This is my reflection. This is my reflection. This is my reflection. This is my reflection. This is my reflection. This is my reflection. This is my reflection. This is my reflection. This is my reflection. This is my reflection. This is my reflection. This is my reflection. This is my reflection. This is my reflection. This is my reflection. This is my reflection. This is my reflection. This is my reflection....etc.